The groom dips his bride for a romantic wedding moment. 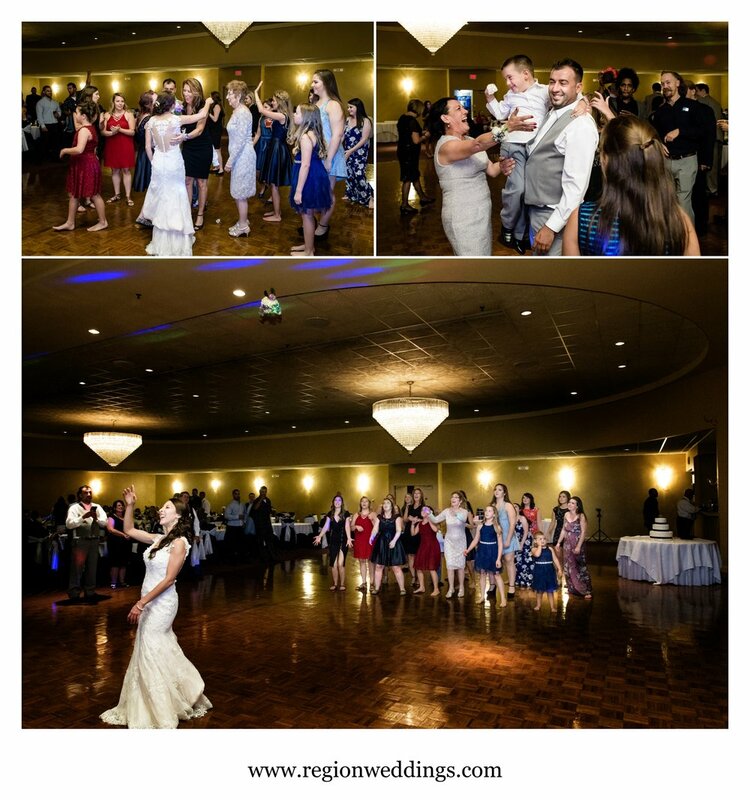 Wow - family and guests, wedding party and bride and groom were ready to CELEBRATE at Marinko and Jessica's wedding at St. Simeon Serbian Orthodox Church in Chicago, IL. Settle in for all of the highlights, from the nervous laughs during getting ready at Vanis Salon to the post celebration outside the church to the bouquet and garter toss at The Serbian Social Center in Lansing. Bridal prep at Vanis Salon in Schererville, Indiana. While second photographer Kerrie hung out with the guys, I photographed the bridal details and all of the moments as the girls got ready for the big day. Jessica looked beautiful holding her bouquet with all of it's blue and purple hues as the golden sun illuminated her hair. We kept bride and groom seperate on each side of the church taking photos as guests began to arrive. Soon it was time for the traditional Serbian ceremony inside of St. Simeon. 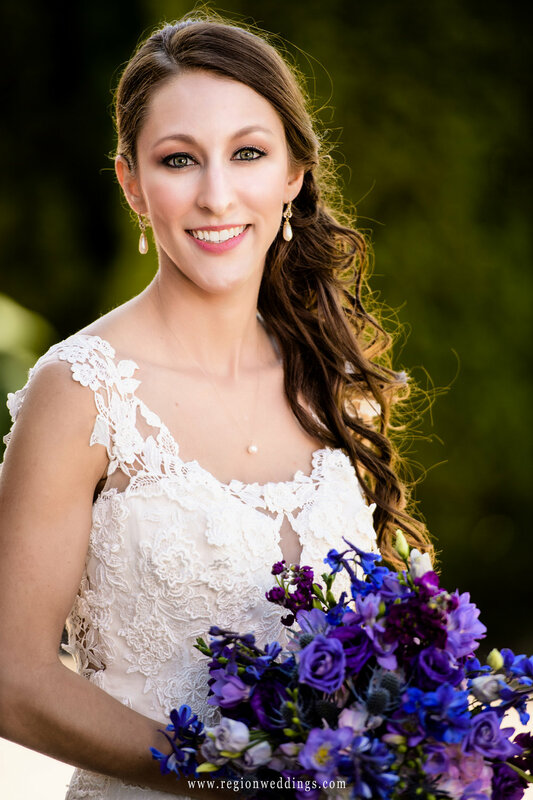 Beautiful bride with a purple and blue bouquet of flowers. Bridesmaids and groomsmen at St. Simeon Serbian Orthodox Church in Chicago. The wedding ceremony had much emotion. The traditional crowning ceremony took place after The Betrothal (exchanging of the rings). The crowning ceremony is what truly distinguishes an Orthodox Wedding from all others. It's a wonderful thing to photograph and the celebration afterwards with music and dancing is a spectacular showing of joy. Jessica and Marinko's church exit was no exception. The crowning ceremony at St. Simeon Serbian Orthodox Church. The bride enters the church as the groom reacts. The post wedding celebration at St. Simeon in Chicago. We all went back inside for bride and groom portraits as well as family photos and the wedding party as well. Soon we would be off to the reception where food and drink awaited. Bride and groom kiss at St. Simeon Serbian Orthodox Church. The bride shows off her dress at St. Simeon in Chicago. Wedding party group photo at St. Simeon Serbian Orthodox Church in Chicago, IL. We did many close up, intimate portraits of the bride and groom on this gorgeous summer day. We also grabbed a few with the lovely church in the background and some fun wedding party photos too. A joyous moment between bride and groom. Bride and groom kiss in front of church in Lansing, Illinois. 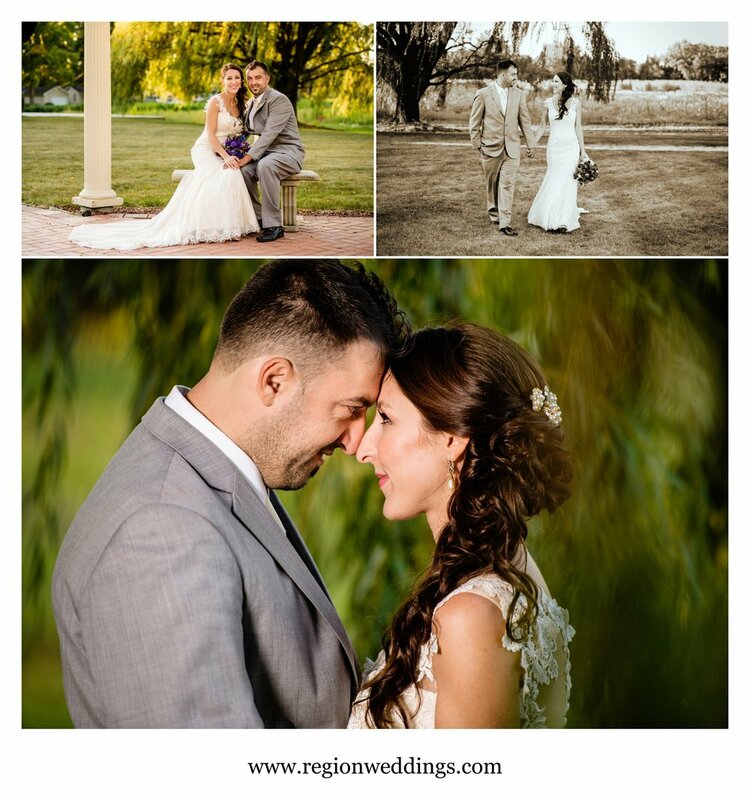 The bride and groom together in some romantic wedding photos after their September wedding. Happy smiles from the bride and groom on wedding day. A fun wedding party photo under the gazebo at Serbian Social Center in Lansing, Illinois. The reception at the Serbian Social Center had a ton of emotion with pure joy being first and foremost. It also had happy tears from family as well as dance floor celebrations. Wedding reception at the Serbian Social Center in Lansing, Illinois. First dance at the Serbian Social Center. Happy tears and joyous dancing at a Serbian American wedding reception. Family and friends dance in a circle to celebrate the bride and groom at the Serbian Social Center. The ring bearer gets congratulated for catching the garter and Jessica throws her bouquet high into the air for the traditional wedding reception celebrations. The bouquet and garter toss at a Serbian Amercian wedding. 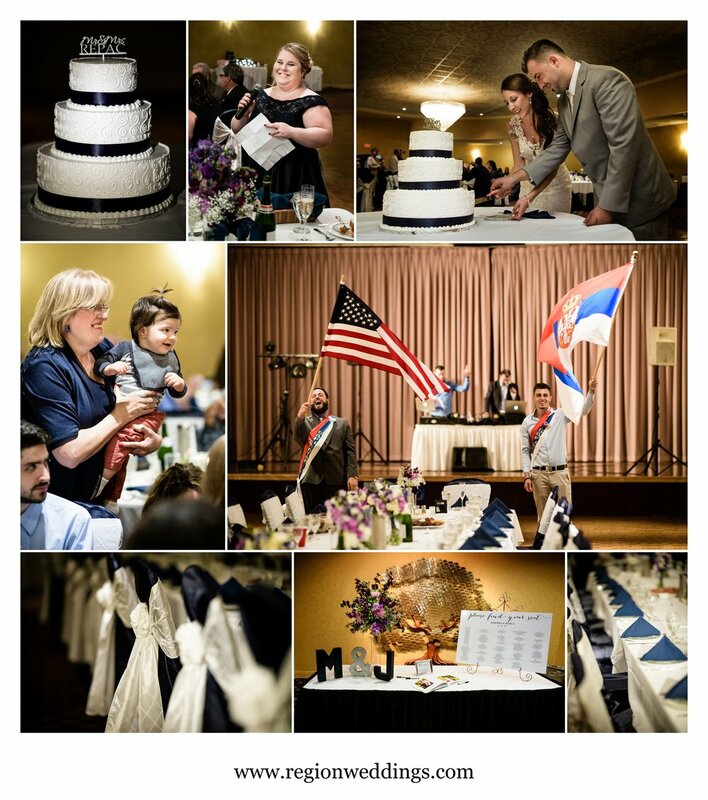 This has been a sneak peek look at Marinko and Jessica's wedding at St. Simeon Serbian Orthodox Church in Chicago, Illinois. Stay tuned as many more photos to come. To inquire about your own wedding, please fill out the Contact Form. Cлавље! !